A recent Sunday NPR financing advice program mocked American attempts at self sufficiency during these financially demanding times. The two examples were the danger of a hunting family's possibly inadequately dressing the game meat, thereby endangering the lives of their family; and the danger of a woman's saving money cutting her own hair, resulting in possibly embarrassing bald spots. The program's conclusion was that Americans should always turn to professional help! The history of our culture is actually quite different; by trial and error, by common sense, by carefully chosen education, our spirit has always been able, through the freedom afforded by our government model, to succeed at “doing-it” ourselves. We are the most advanced country in the world only because we have the freedom and spirit to “do it ourselves.” All our inventions, technologies and ideas came as a result of being free to do it ourselves. Join us this year, our thirty-fifth year of teaching and build the true, not commercial, green. Learn to design with nature, to plumb, wire, engineer, frame, insulate, erect, find water, site manage, move heavy objects, operate an excavator, crane, bulldozer or backhoe to preserve the integrity of your property, to finance, to broaden and transfer knowledge to new dimensions. And, enjoy life with us on our campus and the Hennin Farm. We canoe, kayak, hay ride. We learn to cook lobster, we campfire long into the night, we snowshoe and cross country ski, we sail, make ice cream with a one lung John Deere; we learn to be competent and we make life-long friends. Owning and operating a chainsaw affords you the ability to make your own firewood, clear your property or just maintain your yard. Take this four hour workshop and become proficient at cleaning, maintaining and fixing this small engine. This course is taught by our in house veteran lumber jack, Pat Hennin. Pat has owned and maintained numerous saws for the last forty years. Learn the ins and outs of this incredible tool and leave with a lifetime of knowledge to save you time, money and energy. 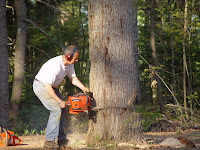 Participants will receive a discount card for the purchase of a new chainsaw at the Shelter Institute (we carry Efco) but if you already own your own chainsaw bring it in to ask specific questions during the workshop. Workshop runs from 9:00am to 1:00 pm and the price is $95 per person. The Purely Post & Beam Class is our most popular seminar -- truly outstanding. The heart of timberframing is exquisite joinery which is done in this class to perfection. Evoloved over thirty five years, this class offers enormous manual skill development, engineering judgement, best use of time, physical coordination, cooperation and comraderie: five joyful days packed with knowledge. Weather along the coast of Maine can be unpredictable but, don't worry, we build inside our 5,000 s.f. heated shop - we keep it at an optimal working temperature. Students build an entire, full-size 24'x24' timber frame in one week. The frame is complete with notched braces, dovetailed tenons, and wedged mortice and tenon joints. We spend quite a bit of time on the use and care of your tools. In particular, you will learn to sharpen your chisels to a razorsharp edge! Classroom lectures include drafting, design, engineering and enclosure. Thursday evening before the raising, a special pot luck supper prepares us for the heavy lifting. Graduates leave fully capable of designing, joinering, assembling and erecting a massive timber frame: an inspiring "can-do" class. The non-refundable registration fee holds a place (or two) in the class. The balance of tuition is due the first day of class. Once you register, we send you our housing and tool lists so you can make appropriate arrangements for your stay. Preview the tool list so you can identify what items you already own and which ones you may need to purchase. We carry a great selection of timber framing tools in our store and offer students a 10 percent discount. Our online store has pricing and product information to get you started but we encourage you to purchase any necessary tools during the class because we have a very thorough tool tutorial on the first evening of the class. Non-Refundable Registration Deposit:$300 To be deducted from tuition - balance due the first day of class. This Registration fee can be transferred once at no charge. A second request for transfer will incur a $100 transfer fee and a third request for transfer will result in the loss of deposit. ShelterBuild.com is where we post articles we have written about changes in the building industry. Subscribe to keep up to date on building techniques and standards and how they will affect your projects and homes. Subscribe to our email newsletter for current events, sales and product information at Shelter. Shelter has been teaching energy efficient, environmentally friendly, cost effective housebuilding since 1974. The Shelter Blog is a newsletter to keep you up to date on our latest class additions, timber frame projects, and woodworking tool reviews. Read about the Patricia Kane Hennin Foundation for pure cancer research. How did you hear about the Shelter Institute?